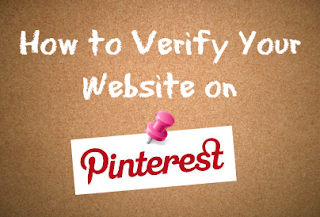 How to Verify Your Site with Pinterest to access Web Analytics? Pinterest is a relatively new social network that revolves around the concept of image-sharing. With over 50 Million active users, it is fast becoming the largest such social network, which gives site owners and webmasters a good reason to get their websites verified with Pinterest. Recently, I wrote a post about Pinterest's latest Web Analytics program, after which a lot of people asked me how to get your site verified with Pinterest to access this analytics feature. So here's my attempt to answer the question, and tell you a bit about why you need to verify your site with Pinterest. To verify your site, go to your Pinterest profile. Click on the arrow next your profile picture on the top-right, and select Settings from the drop-down menu. There, you'll find a website field. Enter your website's complete URL in that field, and then click the Verify button right next to that field. You will get an option to verify your site by uploading an HTML file. This file will be given to you once you click on the verify button. Download this file, but don't close the Pinterest verification page. Go to your website's Cpanel or FTP account, and upload that HTML file to your root directory (www.yoursite.com/). Once you're done, go back to the page you were on, and click on the 'Click Here' link given in step 3 to complete the process. If you run a Blogger blog, or some similar platform where you can not directly upload an HTML file, then you can go into your site's source code (template, or theme code), and upload a meta tag provided by Pinterest. You can get to this option from the same page as HTML file upload verification. Just click on the link at the bottom that says Verify with a meta tag. You can add this code in the header of your website. Besides, after verifying your site, you can access Pinterest Web Analytics which can give you insights into how well your content is doing, and what content is working and what isn't.